Riding lawn mowers are the most powerful tool in any grass-grower's arsenal, and save significant time compared to traditional push mowers. The deck size of a mower is important. The greater the deck size, the larger the area your mower will cut in one pass. When buying a lawn mower, measure and compare deck sizes to ensure the model you buy will work well in your yard. A mower with a deck that's too large for smaller areas is inconvenient and inefficient. Lower the mower deck to the floor and clean it, if necessary, using an air hose or a clean rag. 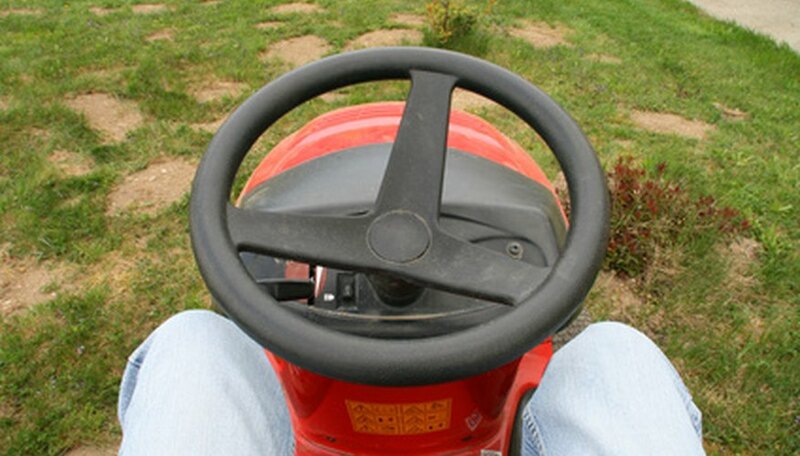 Examine the top of the mower deck for belts that may obstruct your measuring tape. Run the measuring tape over the top of the mower deck, from right to left or left to right, as close to the middle as possible. Secure the end of the measuring tape on the other end of the mower deck and note the size. Run the measuring tape again along the top of the deck, this time from front to back or back to front. Multiply the two numbers for the area of the mower deck. Raise the mower deck. Put the mower in neutral and push it onto a ramp and engage the parking brake. Measure the mower blades to determine the cutting size.